Camping in Colorado will give you an experience to remember. We have remote mountain campsites and clean riverfront tent sites that offer hot showers daily. Bring your RV and the whole family because there are plenty of accomodations that offer all the ammenities with the added bonus of spectacular scenery. Tent campers will find a world of adventure with the abundance of public lands and campsites. If you are looking for camping tips, checklists, recipes, songs or gear you are in the right place. We are building full listings of RV Parks and Campgrounds for your convenience and we hope you will participate and share your camping in Colorado experiences with us at the bottom of this page. Colorado has a multitude of camping opportunities with its' Rocky Mountains, National Parks, State Parks and Red Rock Desert. You will find a diverse landscape to explore and enjoy and we are here to help plan your next Colorado camping adventure. Before you set up camp there are a few things worth considering. Fire safety is imperative and we advise contacting the forest service to know the fire danger in your area. Dig your fire-pit deep and be sure it gets doused with water before you go to bed. Black Bears are a part of the Colorado outdoors and although they are rarely aggressive towards humans they will not hesitate to eat your food. Store food in bear proof containers and keep it out of sight. Never keep food or anything that smells edible in your tent. This includes simple items like toothpaste and canned foods that you might not expect a bear to target. Colorado is a clean state and we practice Leave No Trace guidelines religiously. Pack out all your trash and take any left behind by the previous visitor. Leave as little impact on the land as possible. We advise carrying a first aid kit, extra food and water, and a shovel. We also like to carry a SPOT Satellite GPS Messenger unit for extra safety. These things can get you out of bad situations and save your life with the push of a button. 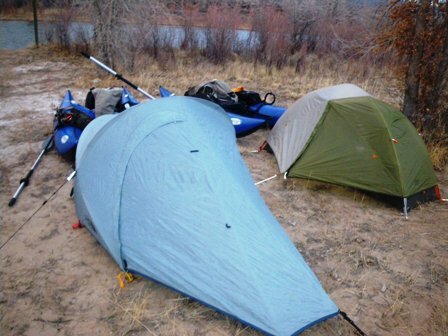 Public campgrounds are plentiful and easy to find in Colorado. Many are located on National Forest or BLM land and some require a small fee while others are free campsites. Most of these campgrounds have an outhouse, benches and fire pits. The majority of the sites are for tents while many will fit RV's however hookups are generally limited. If you like a hot shower and the idea of quiet consider a private campground. Most of these are located in ideal recreational areas and they have all the supplies you will need. This includes firewood, a small store for supplies and private land to ensure your peace. They are more expensive than public campgrounds but can make a nice base camp. Tent camping is a great way to experience the outdoors. I have lived in a tent for several summers and I now almost prefer it to the indoors. Tents are compact and easy to travel with and they usually set up and take down easily. Coleman tents are a trustworthy brand but there are many good tents on the market. You will want a tent that can keep you warm and dry but also breathes to reduce condensation. Also known as tent trailers these tow easily and provide a comfortable shelter. Pop-up trailers are ideal for camping in Colorado because of the living space they provide without taking up too much room on the road. Rv's are a convenient way to camp. They are ideal for long term camping and provide all the conveniences of home. If you do not own an RV and do not want to buy one consider a rental. Renting an RV is the perfect way to travel and explore the state. For family camping ideas visit Family Fun Together. They have a great site filled with family camping information.